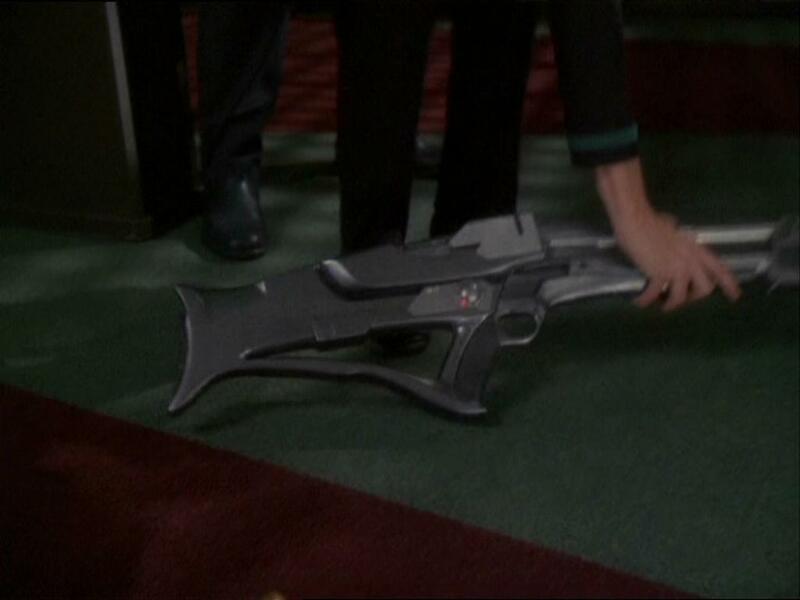 An experimental weapon developed by Starfleet Security. It fires tritanium projectiles propelled by expanding gases from a chemical detonation. 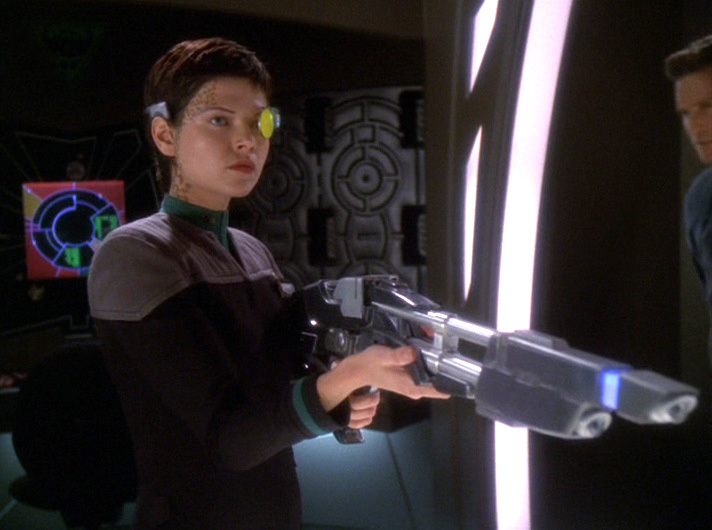 This rifle was designed for use in areas of high electromagnetic (EM) interference (whether artificial or natural) that would render phasers useless, but was dropped in favour of regenerative phasers. 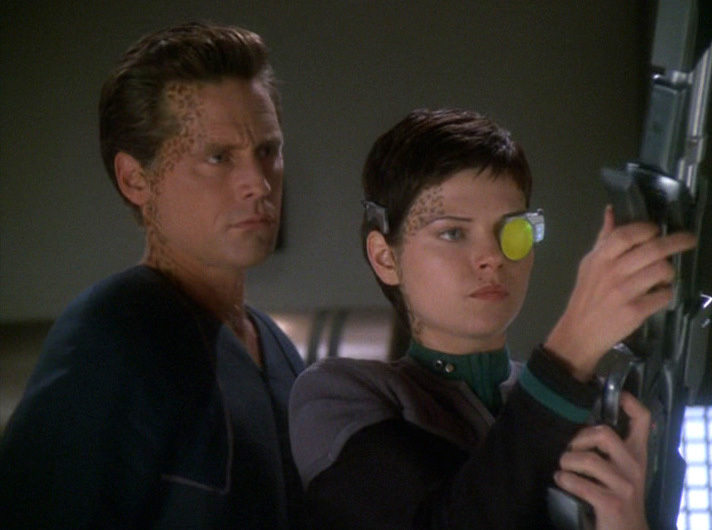 Access to the replicator pattern for this design is restricted to Starfleet officers. 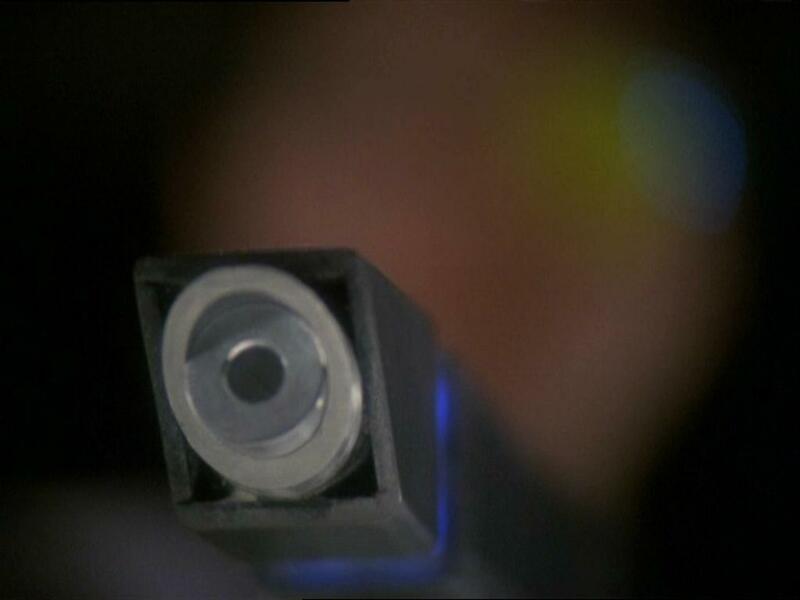 One unique aspect of the gun is its Exographic Targeting System, a separate sighting device which communicates with the weapon. 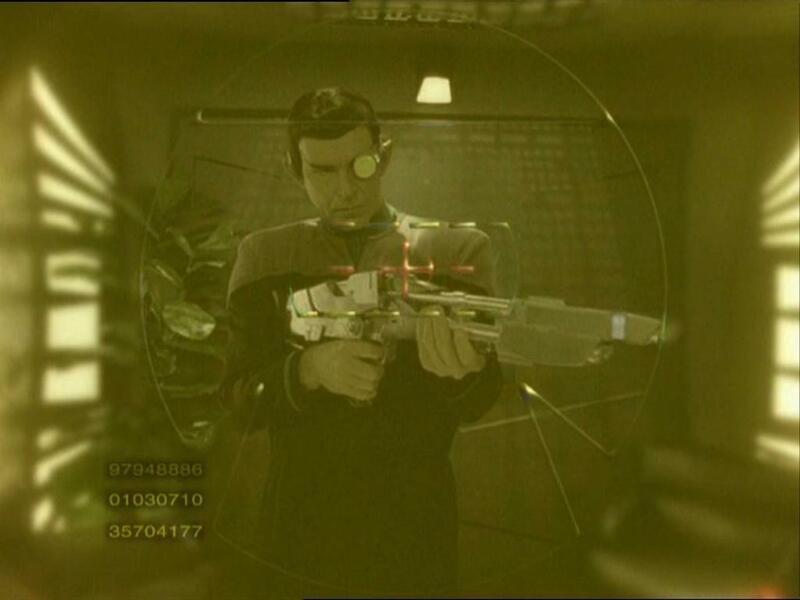 The operator wears a wire frame helmet with a monocle attached over one eye, and moves a mouse trackball (mounted on both sides of the weapon, making it ambidextrous) located on the rifle to zoom in to the target. 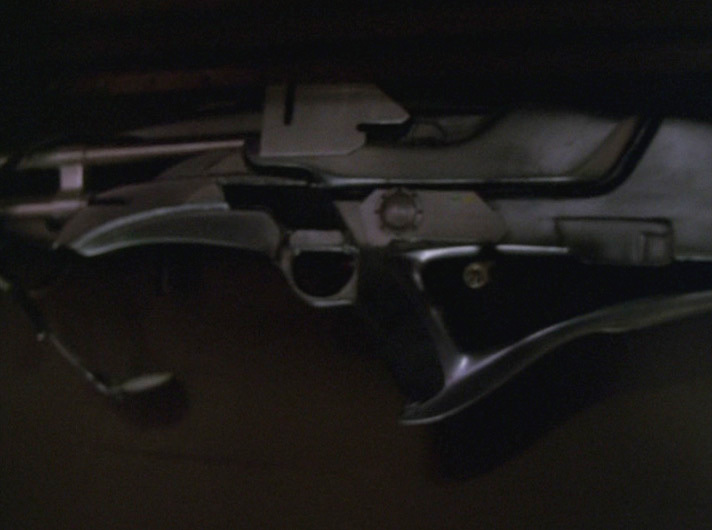 The magazine is contained in the forward handgrip under the barrel, being removed by releasing a catch and sliding it forward. 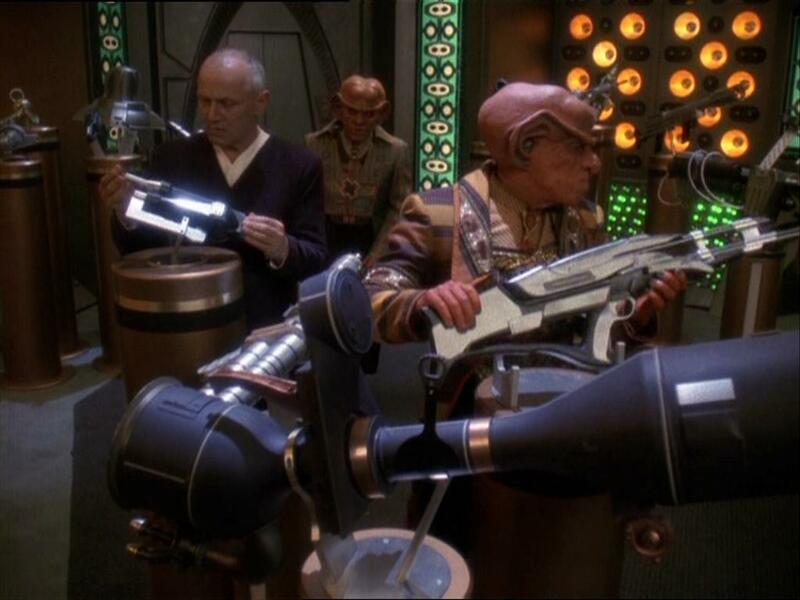 In 2375, one of these rifles was modified on Deep Space Nine with a micro-transporter connected near the barrel exit. The rifle dematerialized the bullet after firing and rematerialized it just in front of the target, and could possibly have done it inside the victim. 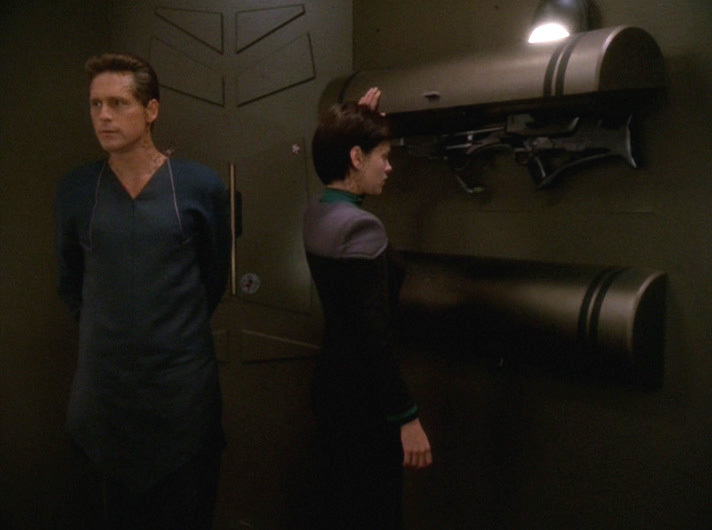 The person responsible, a traumatized Vulcan officer, murdered several Starfleet personnel before being wounded by another modified TR-116 and taken into custody. 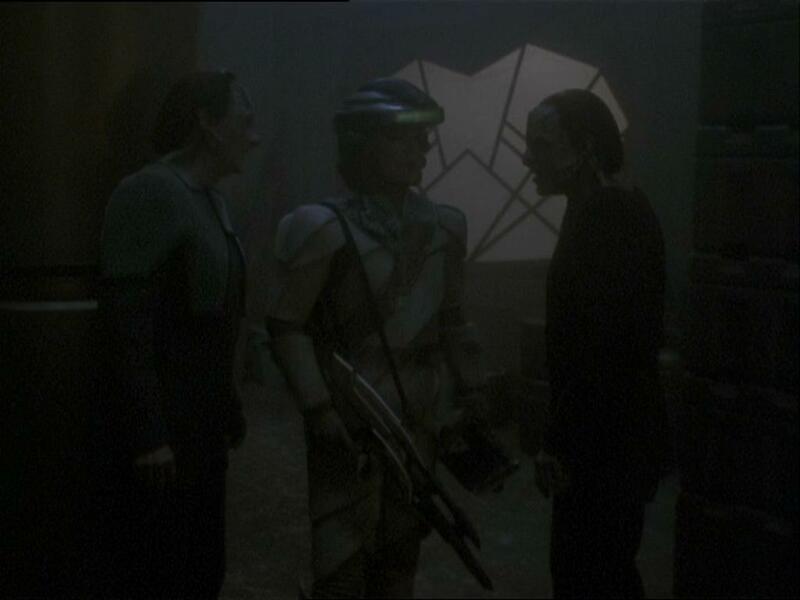 Seen in DS9's "Field of Fire." Essentially a McGuffin to provide the perfect 'locked-room' mystery, and an SF variant on the cold, calculating sniper/assassin, watching his oblivious prey. 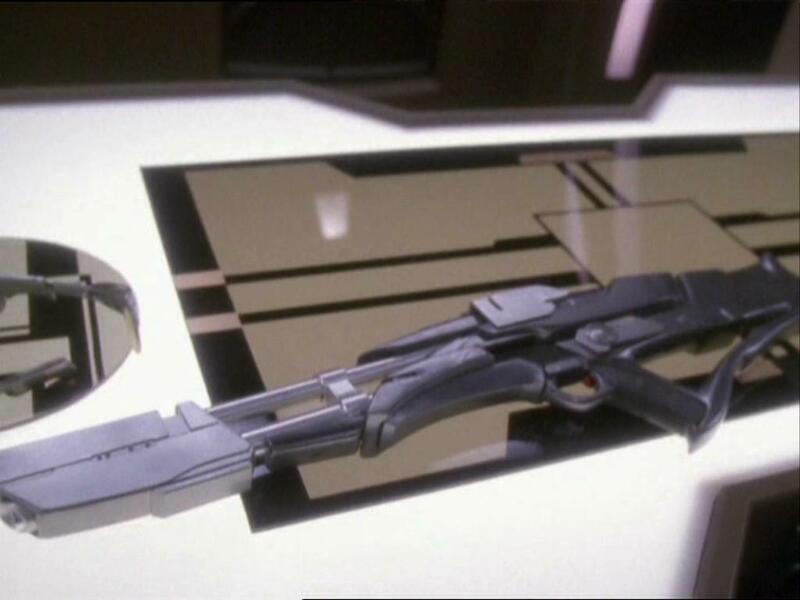 Why couldn't they have it using an electromagnetic propulsion system, making it a 'Gaussrifle' or 'Rail Gun' - and therefore much more futuristic? Because the bodies needed to have powder burns suggesting they had been shot at close range when it was patently impossible for them to have been. . . 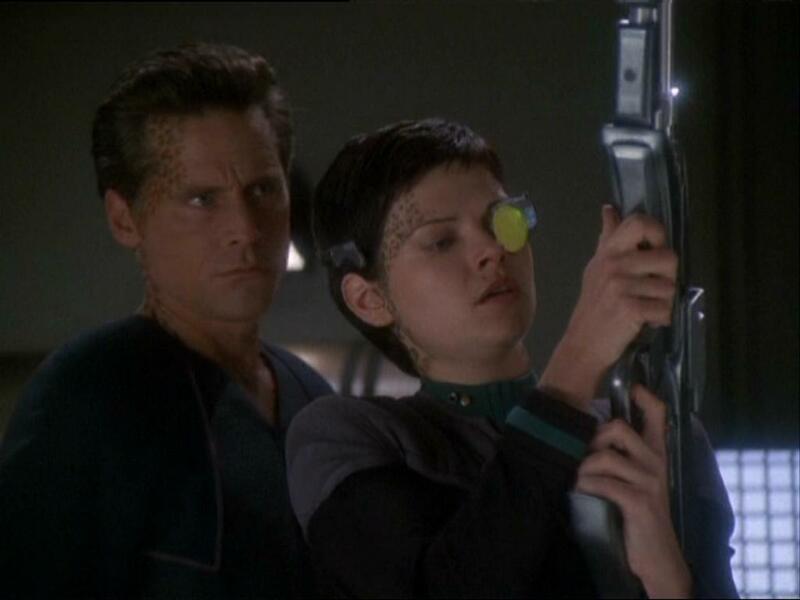 It could be that this rifle was designed with the Borg in mind, since projectiles have been proved effective against them - although the bullets were holographic in nature, which might have made a difference. 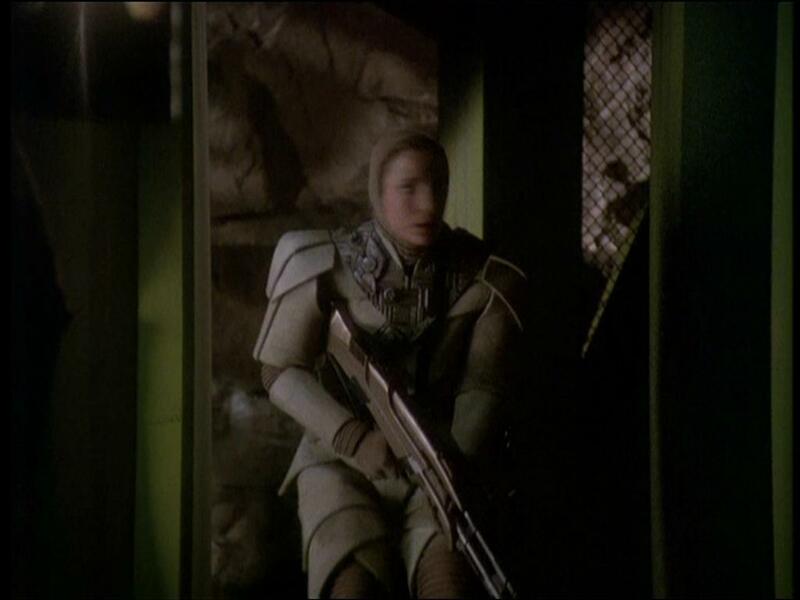 Plus, the stand-off capability of the modified weapon could be used to hit a drone before it is aware it is being shot at - Seven of Nine has been able to block phaser beams while looking elsewhere, but she must have been subliminally aware of them. 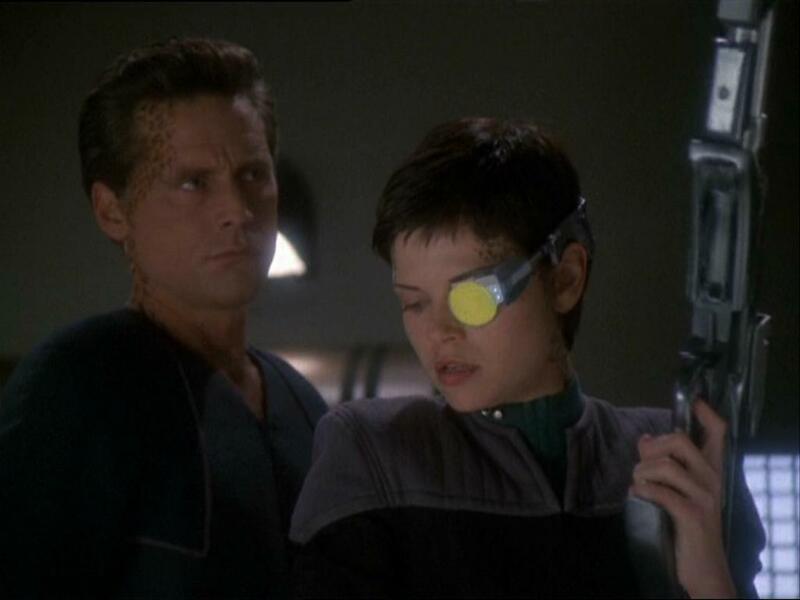 Surely not even the Borg could anticipate being shot through a wall. . . 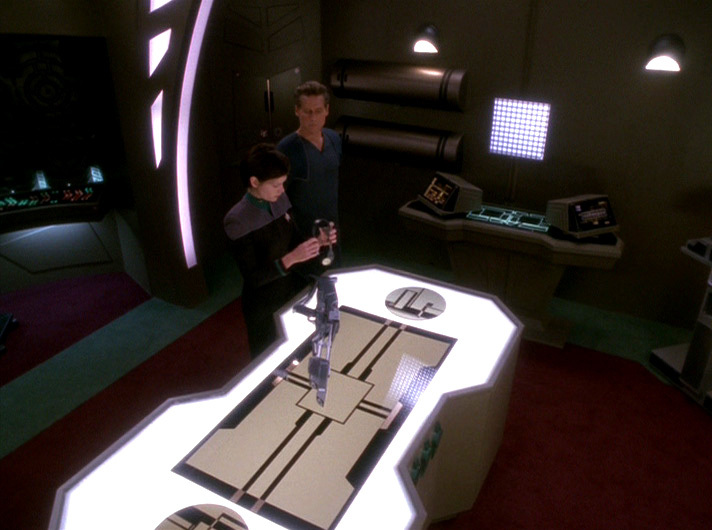 However, since it utilises a transporter, the modified TR-116 would be easily blocked by a force-field. 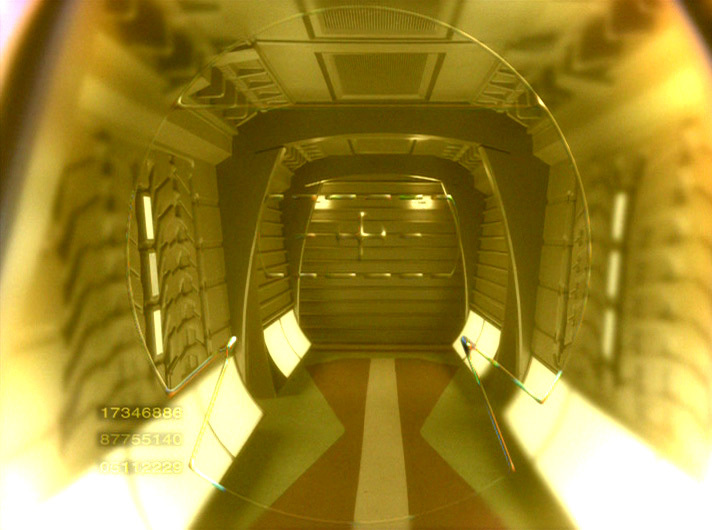 . . and how detectable is the scanner/x-ray effect? 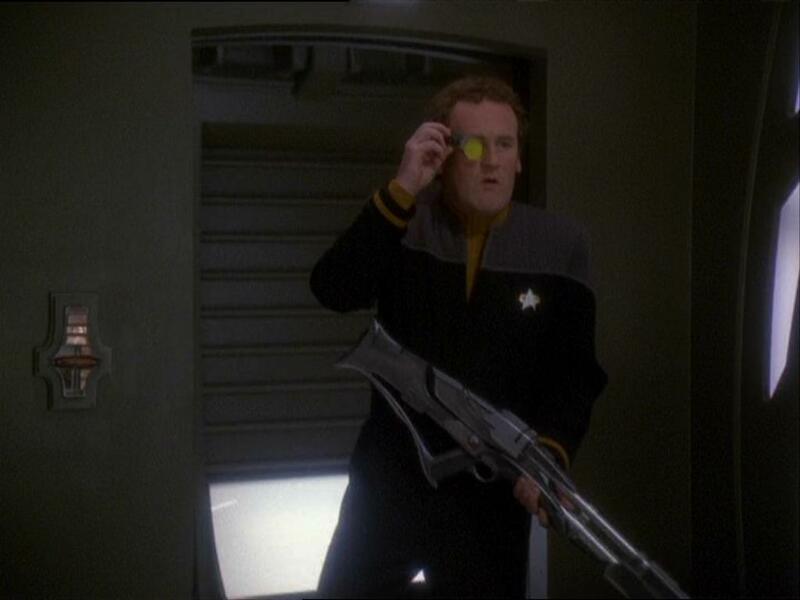 More to the point, how often have we seen areas where phasers are useless? 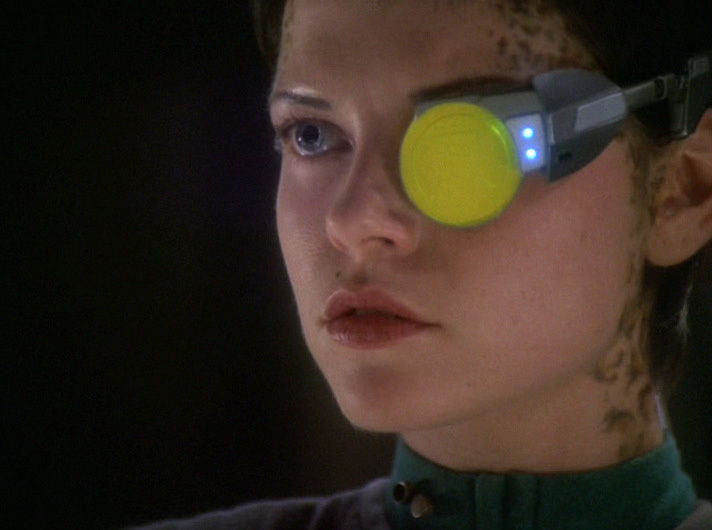 The only times I can recall (and that others have reminded me of) are Chekov's weapon in Star Trek IV: The Voyage Home, artificial damping fields in DS9's "Blood Oath" and Voyager's "Future's End," plus interference caused by the Iconian gate in DS9's "To The Death." 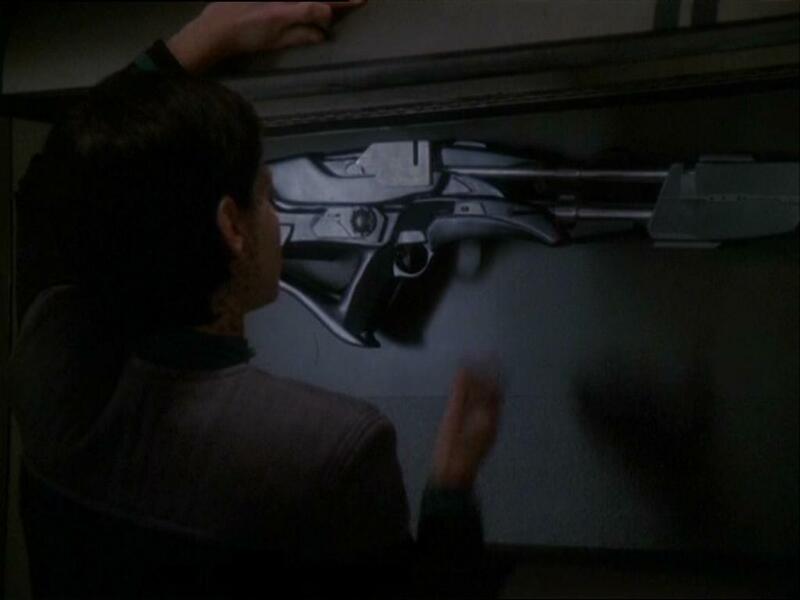 In the DS9 episode "Business as Usual," made nearly two years prior to "Field of Fire," one of the weapons sold by Hagath is quite plainly the TR-116 prop, but with components in different shades of grey (as opposed to the uniform gunmetal of the Starfleet weapon). 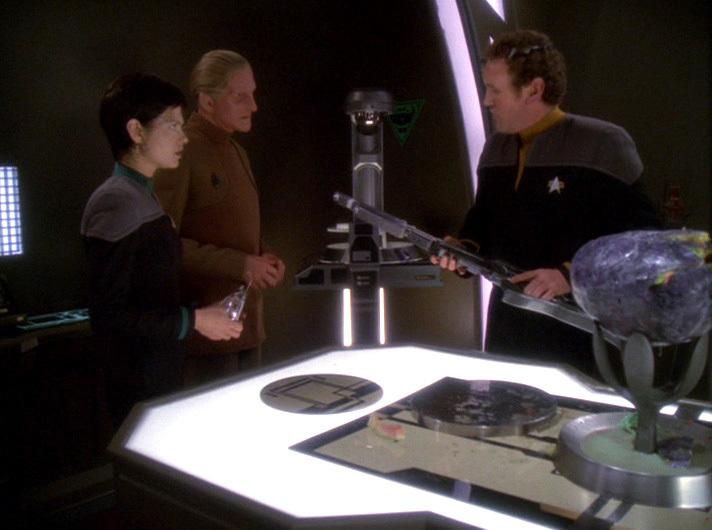 This has now been revealed to be a Breen disruptor rifle (since as everyone knows, in Star Trek: Generations it's revealed they're one of three Alpha Quadrant races to use such weapons). 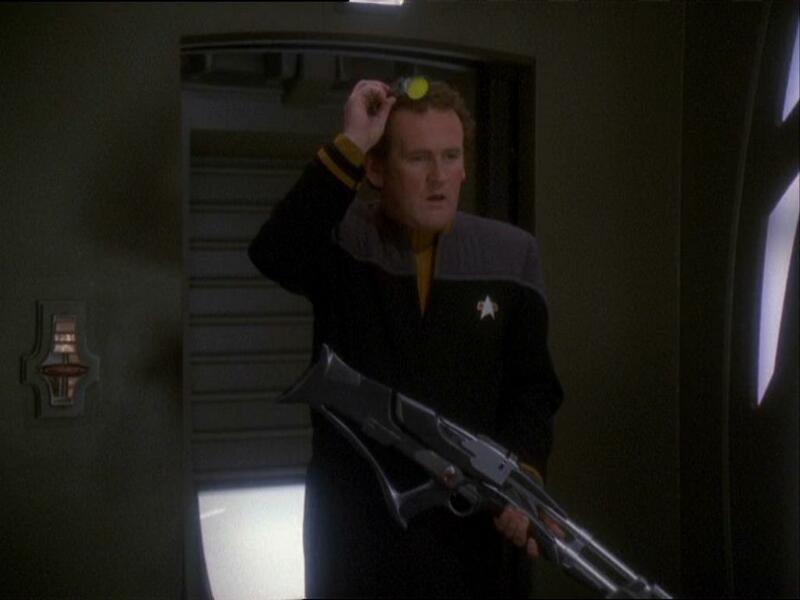 In fact, the Breen had been seen carrying these weapons in the 4th-season episode "Indiscretion," and it made a couple of appearances in the "Final Chapter", barely visible in "Penumbra" and "What You Leave Behind." 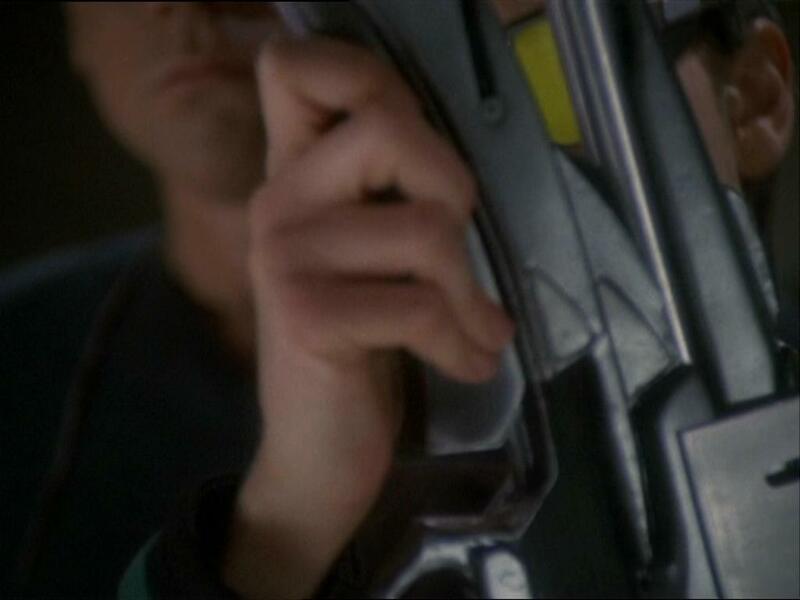 Most interestingly, the gun-muzzle assembly is absent from the Breen rifle. . . 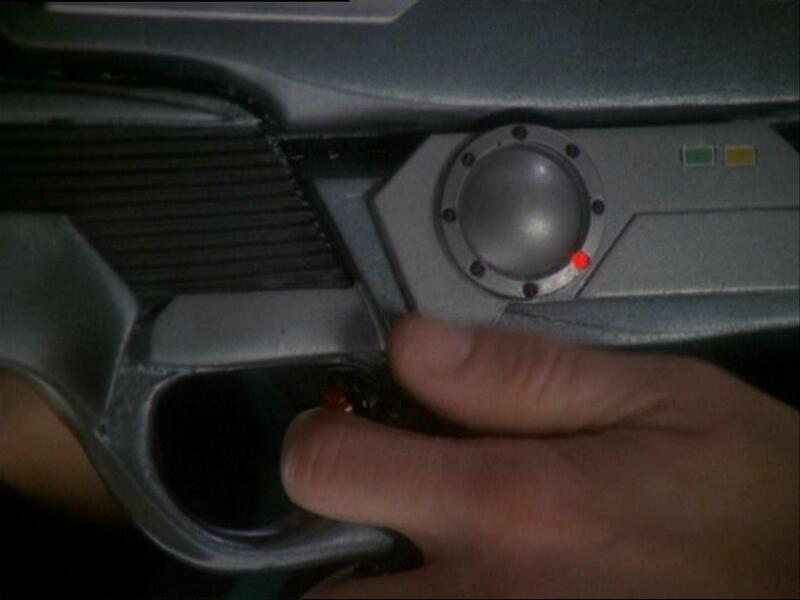 Which must mean the whole assembly is intended to represent the microtransporter, and that the 'real' TR-116 might not have any sort of muzzle assembly (such as a muzzle-flash suppressor, or another entirely different sensor-aiming package); or, was it a simple bit of kitbashing to differentiate it from a prop seen briefly in an older episode. . ? 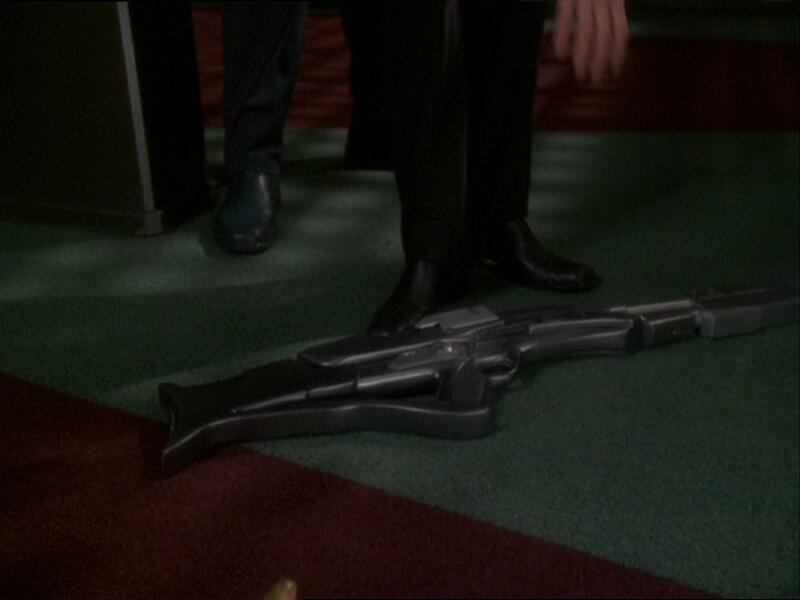 On the other hand, the killer's weapon's muzzle assembly is identical, so unless Starfleet has a standard-issue Microtransporter for fitting on the ends of guns, the issue remains open.